Following example shows how to store multiple items from previous cut/copy/paste actions. 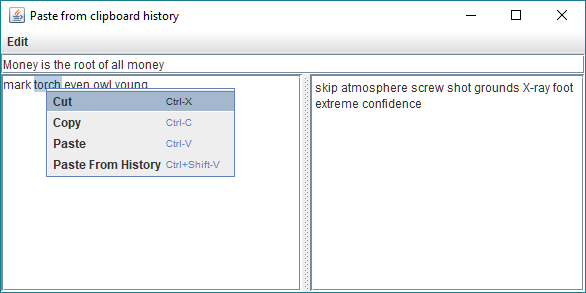 These items (clipboard history) can be accessed via menus or Ctrl+Shift+V shortcut for the current paste selection. In above class, we are keeping history of only 20 recent items. Older items are discarded, for that we are using following utility class (taken from this example). Cut/copy/paste/paste from History actions can be invoked from shortcut keys or via right click menu or JMenuBar. Externally copied items to the system clipboard are only available in the application after we pasted them via standard paste action. 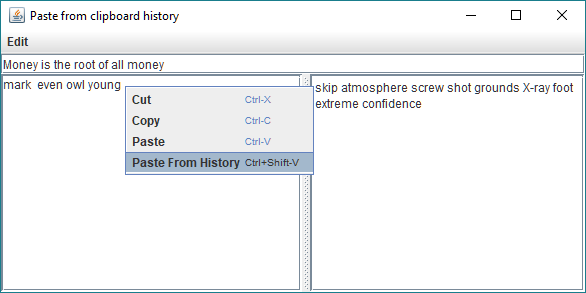 On clicking 'Paste From History' menu (or via key Ctrl+shift+V) another popup shows up listing previous items which can be selected by clicking.